By now, some of you have probably seen this viral post going around about a doctor’s visit from hell going around, because as of time of writing, it’s amassed 14K shares after it first went up on the 20th of March. Before we go into this, we would like to clarify that aside from the photo of the receipt, there is no verification that the incident went exactly as described by the post or if it even occurred. We’re only taking this as a point of conversation to talk about: if something like this happened, what can you actually do about it and what are your rights? Contained in the 400 word diatribe is the chronicle of a sick woman facing an unpleasant doctor’s consultation a well-known clinic chain. After initially diagnosing the patient with dengue fever, the doctor wanted to draw her blood for further tests. Three failed attempts later, he then declares that she probably doesn’t have the dengue. So he then suggests a flu injection instead, which she agrees to. 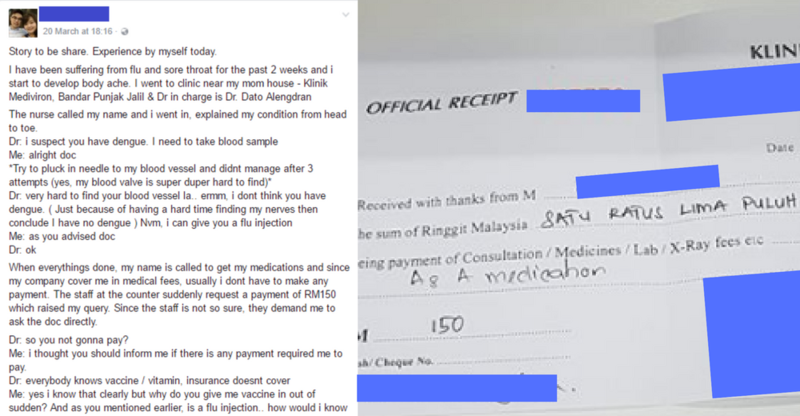 She later finds that she she needs to pay the clinic RM150 even though her clinic visits are usually free, presumably because she is covered under an insurance plan. She goes up to the doctor to question the charges, and the doctor insinuates that she can’t afford to pay, because she is poor. He then threatens to complain to her company. She then decides to pay, so that she can get a receipt as proof of this whole debacle. Of course this is all based on her side of the story and may not accurately reflect the actual events. And since we have yet to hear from the other side (and also so that we’re all on the same page) we’re going on the assumption that the events transpired exactly like what she listed. Unfortunately, nobody in Vulcan Post moonlights as a secret doctor, so we got in touch three of our doctor contacts and presented them with the post to get their thoughts. Here’s the gist of what they told us: how the doctor conducted the session was dubious, but the patient could’ve handled it better too. This is, of course, assuming that everything happened exactly as the poster described it. Even most of the doctors we asked pointed out that we’re just hearing one side of the story and that the real events might come across a little differently. So most of them couldn’t comment much on whether the doctor was really being rude or not, but they had a few educated opinions on the other events that went down. Here, some of the doctors already disagreed slightly. Most of them thought that, based on the symptoms described by the patient, they wouldn’t have gone with the dengue diagnosis anyway. That being said, some of the doctors did think that it was a good idea for the doctor to check for dengue anyway until proven otherwise, if the patient presented with a high fever on top of the other illnesses that she described. So the doctor in the story was probably just trying to get blood for dengue just to be safe. Tried to get the help of a nurse or another doctor to get the injection done. However, since this is a private group clinic, the doctor was probably the only doctor in the building. Outsourced the dengue check to a hospital, or at least another clinic that is better equipped. Instead, after poking and prodding, the doctor simply changed the diagnosis and told the patient that it’s probably not dengue, which is ethically dubious. 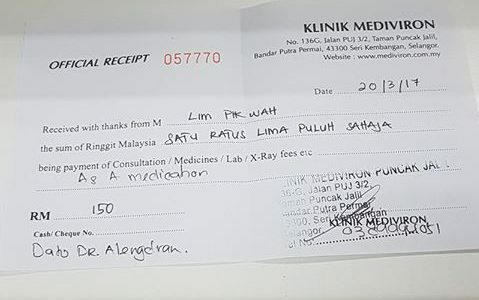 One of our doctor contacts even pointed out that at least where he operates, a flu shot would cost no more than RM100, but somehow was hiked up to RM150 during the session. And on top of that, the clinic was charging the patient for the injection too as it wasn’t covered by her insurance. There’s no solid rule for this, but as the patient pointed our herself, it can’t hurt a doctor to inform the patients that an injection is going to cost them some cash before they jab needles into the patient’s bloodstream. At the very least, to avoid this exact problem. According to some of the doctors we surveyed, an itemised receipt might’ve helped the issue instead of putting it down all in a lump sum. And while in her case the doctor is only charging her for one injection, it was listed as “medication” instead of clearly labeled. The doctors did note that is is more common practice for private clinics to give a non-detailed receipt rather than an itemised one, especially for a private group clinic. 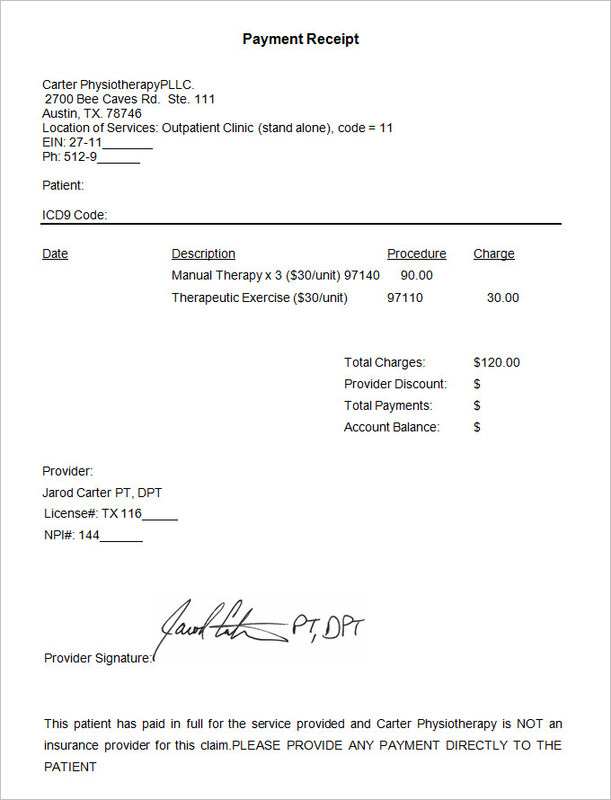 But considering there’s a possibility that the patient was overcharged, an itemised receipt might help either protect the clinic, or cause less confusion and anger from the patient. Here’s a risky thing about doctors: we trust them with our lives. On one hand, we might have no medical knowledge at all and they clearly stand at a more superior position if we’re going into a room looking for treatment and info. That’s fine, but when doctors suggest any treatments we tend to do it without question. So for your next doctor’s appointment, before you put anything into your body, ask. One of the doctors said that the age of medical paternalism is over, and doctors don’t and shouldn’t force a patient into anything. Their job is to empower the patient with information, and whether the patient agrees to it or not is their choice. So make that choice. Get as much information as possible from a doctor, especially if it’s going to cost some cash, and actively make decisions about your body. And in fact, you are even entitled to ask for an itemised billing of what you’re being charged for, upon request to the clinic or hospital. So if you think you’re being overcharged for something, ask for a full breakdown for what you’re being charged for, and this would make for a clearer case if you ever choose to lodge a complaint. 2. If Something Similar Does Happen To You, Complain To The Right People. And this is the most important aspect of this whole issue. When the patient created the post on Facebook, she was probably just trying to warn other people about how this doctor mistreated her. But as one of our doctor contacts pointed out, her method of complaining might get her sued by the doctor. And even if she’s proven innocent, going up to court is already a lot of time, energy and money that will have to be wasted on the issue. If the patient’s purpose for the post is not as a rant, and more as a way to prevent other patients from going through what she did, the doctors agreed that going on Facebook to air her issues is not the right way to go. 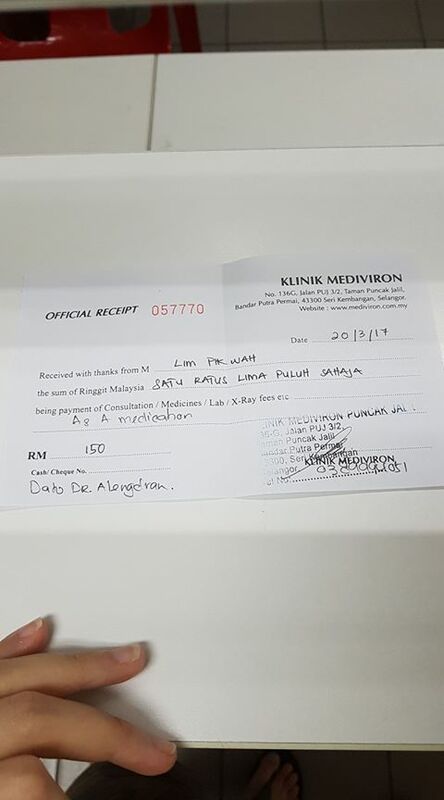 Instead, she can get the doctor’s medical number and name, then lodge a report to the Malaysian Medical Council, or the Malaysian Medical Association. Thanks to her legal rights as listed here, the patient can ask for the doctor’s full name and registration number here, and with the info that she got, file an official complaint. In fact, one of the doctors even pointed out that she can copy-paste the exact complaint that she posted on Facebook, and instead feed it to the right channels. This is a better way to get your complaints heard by the right people. The council can do their own investigations on the issue, and if the doctor was really deemed in the wrong, they can take action against the doctor by not renewing his medical licence, for example. You can find the form to fill in your complaints here, and find out more info about filing complaints to the Malaysian Medical Council here. Again, this is of course assuming that things happened exactly like how the patient described it. The most important takeout from this whole issue though is that we as patients should become more educated about our rights as Malaysian citizens, and what we are entitled to in healthcare. You can find out a little more about your rights here and here (which, incidentally states that as a patient, you are entitled to know your what medicine is being injected into your body, an itemised account and billing of the whole procedure for no extra charge, the cost of the medications, and information about your medical practitioner). Know your rights, and stay healthy, folks.